Sometimes, oral surgery is required in order to maintain the health of a smile. Our Belleville dentist is able to perform a variety of oral surgical procedures for patients. This is an alternative to having bridge work or partials done. Usually when the tooth and its roots are damaged, the best permanent solution is to get a dental implant with ceramic crown. The implant is installed as a single unit, and you will have immediate, full functioning teeth that looks and feels natural. The treatment time is short and there is minimal pain involved in this procedure. Luckily, these oral problems can be simply avoided or resolved with a wisdom tooth extraction procedure. Our friendly dentist will be able to tell you whether a wisdom tooth removal procedure is right for you. Bone grafting is a procedure that is required when a patient does not have sufficient bone to support a dental implant. A bone graft will ensure that there is enough bone mass present in the patient’s jaw to hold a dental implant in place permanently and dependably. Autogenous bone graft or autograft, using bone harvested from another location in the patient’s body. Allogenic bone graft or allograft, which uses non-living bone from a cadaver. Xenogenic bone graft, using dead bone from another species, typically that of a cow. A synthetic bone graft, using a biocompatible material to build up the patient’s jaw bone. In some cases where a dental implant is being placed in the upper jaw, a sinus life may be required to build up the bone volume. 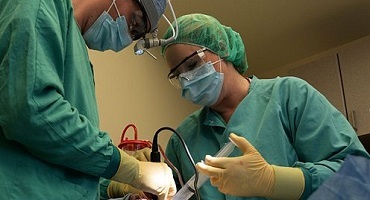 And depending on the patient’s unique situation, the bone graft may be performed at the same time as the implant procedure, or may be performed before it. Patients can feel free to speak with our dentist in Belleville about which bone grafting material would be most suitable for them. A frenectomy is a procedure that involves removing the band of tissue (referred to as the “frenum”) that lies between the two upper front teeth. Some children have a frenum that extends between the two front teeth, pushing them apart from each other and creating a gap. In these cases, a frenectomy is able to prevent the frenum tissue from interfering with the proper positioning/development of the two front teeth, ensuring they are able to erupt side by side without a space. If there is already a space between the patient’s front teeth, the frenectomy should ideally be performed after he or she receives orthodontic treatment to close the gap. Oral surgeries may be necessary in order to maintain a healthy smile. Our Dental Services include : Endodontics (Root Canal) | Cosmetic Dentistry | Periodontics (Gum) | Children Dentistry | Preventive Dentistry | Restorative | Dental Implants | Prosthodontics (Dentures) | Sedation Dentistry | Night Guard & Sports Guard | Oral Cancer Screening | Oral Surgery | Emergency Dentistry. Request an appointment with Dentistry By The Bay, dental office in Belleville. Our dentist performs a variety of oral surgical procedures for patients. For dental inquiries Call: (613) 966 5118 or Email: info@dentistrybythebay.com.